Dams are as old as civilization itself, but it’s only been within the last century that humans harnessed the construction savvy to build structures that could submerge valleys and create lakes. And bury entire towns in the process. In America alone, engineers have flooded hundreds of now-forgotten towns in a bid to create power-generating and fresh water-supplying reservoirs. But now, thanks to water shortages caused by a changing climate and increasing demand, many of the so-called “downed towns” are reemerging, broken and dusty, from the water. 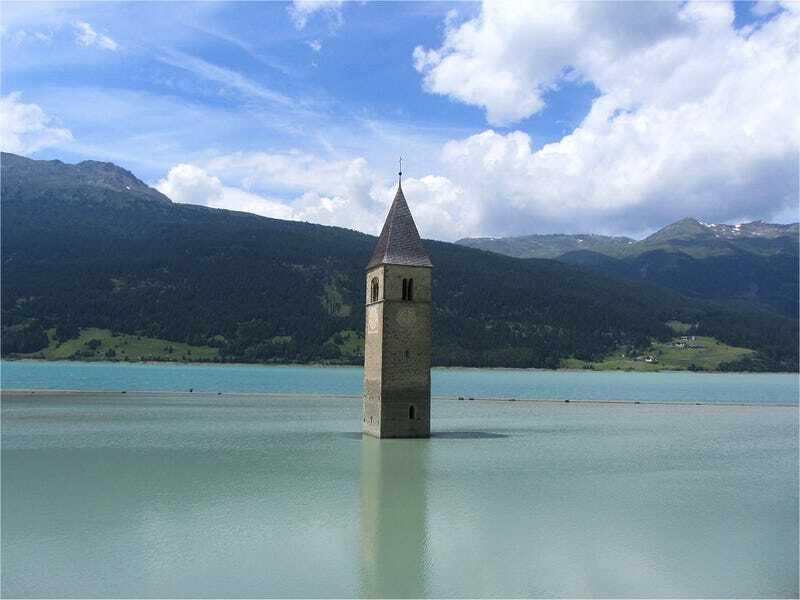 Today, Slate and Atlas Obscura take us to a small artificial lake at the nothernmost tip of Italy, where an a 700-year-old belltower peeks above the waters. The photos were cause to look into the history of other drowned towns—and boy, did we find a glut of dramatic images. In fact, submerged towns are so common, it's fairly likely you live near a reservoir that's concealing the remains of one (you can check a partial list of American instances here). A few of the most interesting follow. There are actually multiple submerged towns dotting Lake Mead, including the most famous, St. Thomas. When droughts drain the 80-year-old artificial lake, foundations and sometimes even walls emerge from the sands. Vilarinho das Furnas, a town dating back to Roman times, was submerged by engineers in 1972. Interestingly, the tiny community of 300 had been almost forgotten by Portuguese authorities—when it was scouted by engineers in the early 1970s, they found a community governed by an unusual communal political system that some historians speculate dated back to the Visigoth occupation. Image via Atlas Obscura and Juan Tello on Flickr. The town of Potosi, in Táchira, Venezuela, was flooded in 1985 to generate hydroelectric power for nearby developments. But a water crisis in Venezuela is laying the ruins of the town bare—starting with the church steeple that once marked its pinnacle. Images via Andre Estima on Flickr. Petrolandia is home to one of Brazil's largest hydroelectric power plants—during construction, entire towns were moved to higher ground. One vestige of the old landscape still remains: the arches of a church that was left, abandoned, to the flood. Image via Atlas Obscura and Wikimedia Commons. This 700-year-old belltower was restored to its original site in 2009, after the entire village of Curon Venosta was flooded after World War II. In winter, you can walk right up to its walls.